From a perch on West 20th Street and the principles of an editorial mandate independent of 501(c)3 publishing parent the Natural Resources Defense Council (NRDC), OnEarth magazine has been since 1979 at the forefront of environmental journalism. 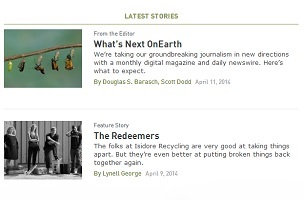 Per a note to readers from EIC Douglas S. Barach and online editor Scott Dodd, there is about to be a big change. Of course, we feel a little sad about ending our 35-year print run, but reinvention has long been a part of OnEarth’s DNA (when we first started publishing, we were called The Amicus Journal). Helping lead this new charge will be five staff writers, as well as editor-at-large Ted Genoways and news blogger Jason Bittel.